Did you know that mustard is super duper easy to make? All you need is a little patience, and you’ll have a condiment that will really impress dinner guests. Mustard requires no cooking (in fact, heating the ingredients ruins the flavor) and barely any mixing; very little technique is needed to make pretty good mustard. At most, mustard-making requires a bit of creativity. As long as you stick to a general formula, you can go crazy with mustard flavorings. You can add whatever kind of spices, herbs, and liquid flavorings your mind can conceive of (that you think would be tasty, of course!). 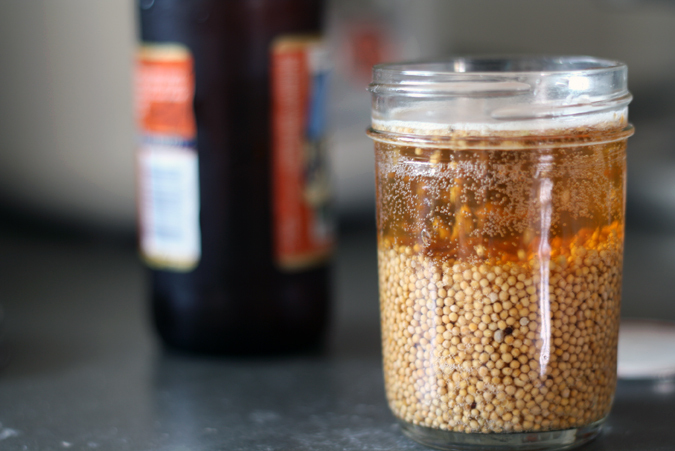 A general rule of thumb is to have a 1 to 1 ratio of mustard seeds to liquid, by volume. Depending on how acidic you want your mustard, the vinegar component can run from 1/4 to 3/4 the volume of mustard. For those of you who are die-hard recipe-followers, I highly recommend putting on your creativity hat and trying your hand at some food improvisation with mustard. It’s low-cost and low-risk. Even if you mess up, your “mistake” will be totally edible, if not totally fixable with post-processing adjustments. Mix together vinegar, beer, salt, and sugar. Let the mixture sit at room temperature, covered, until the seeds expand and absorb most of the liquid (4-8 hours). Add the concoction, liquid and all, to the food processor and processor until it reaches your desired consistency (5-7 short pulses will create a chunky mustard). Let the mustard ferment at room temperature for up to three days. It will become spicier the longer you leave it out. Refrigerate after that. The mustard will last in the fridge for up to a month. this is the mustard concoction before it really got to soak up the liquids. This is a guajillo chile. Here’s a little more information about it on Wikipedia. Here’s the mustard after it’s absorbed the liquid! Cool, huh? Science-y! After this, it’s a quick whiz in the food processor, and it’s done. I probably don’t need to tell you what to use mustard for. You can put it on your burgers and dogs. You can put it on your turkey sandwiches. My favorite way to eat it is very simple. I just like to slice up a brats or a kielbasa, smear a lot of mustard over the pieces, and eat them with any kind of pickle. I love that you used pumpkin beer in this! I still haven’t made my own mustard. I really need to give it a try. It’s SUPER easy that after I made it, I was like, “How have I not been doing this the whole time?” Good luck! I did not know that mustard was easy to make :). Maybe someday I’ll try to make it myself, why not, that way I can get the exact flavor I like. Totally! :) It’s one of those things where people assume it’s difficult to make so it impresses people. So far, I’ve gotten a lot of, “Oh my God! You made this? !” responses from friends and family.